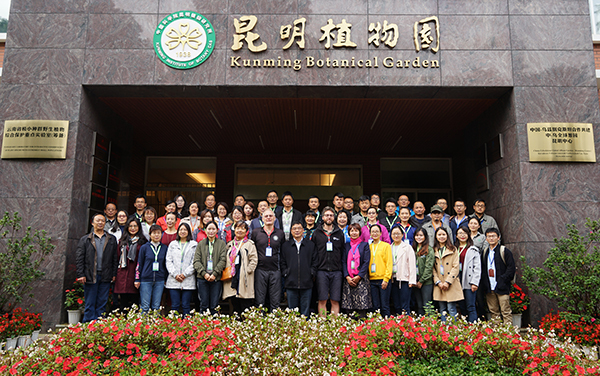 From 14th – 22nd November 35 staff from 20 of China’s Botanical Gardens have been attending a horticulture training course at Kunming Botanic Garden. This course has been arranged by the Chinese Union of Botanic Gardens (CUBG), with the aim of raising horticulture capacity throughout China’s Botanic Gardens. The RBGE has had a historic relationship with China, which has developed from simply collecting plants to helping to conserve plants within China. As part of this RBGE will now work as a partner to develop and deliver horticultural training with CUBG and we are looking at the model of the RBGE Certificate in Practical Horticulture coupled with our Train the Trainer programme, so that our training input is maximised. The course at Kunming was a trial for how this could work, with members of RBGE staff, Leigh Morris and Martyn Dickson, travelling to Kunming to teach some of the CUBG course. Alongside the teaching, Leigh Morris also had the opportunity to meet with Dr Chen Jin, Director of Xishuangbanna Tropical Botanical Garden and Chair of the CUBG and Dr We-Bang Sun, Director of Kunming Botanic Garden to discuss the longer-term plans for this partnership.